Gabriella’s artistic skill was first rewarded in 1983 when she gained an award in the prestigious Alice Springs Prize while still a student at Yirara College. Her work has been praised as being “innovative” and “culturally significant”. Gabriella uses modern materials (acrylic paints on canvas) to create traditional designs. Her colours are inspired by the dramatic contrast in colour of the Central Desert landscape. Gabriella’s Dreamings include Women’s Ceremonies, Goanna Dreaming and the Seven Sisters Milky Way Dreamings which have been handed down through generations of ancestors. 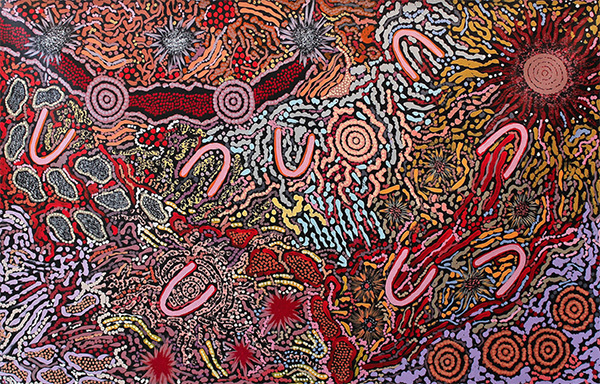 Her work is represented in the National Gallery of Australia (Canberra) and the Museum and Art Gallery of the Northern Territory. Some of her most famous work has included the 2008 Chelsea Garden Show. the design of the Art Tram during the 2014 Festival of Melbourne, and the design of the Opera House for the 2016 Vivid Festival in Sydney.